The Automatics are being reviewed on Kick Down The Doors because Steve makes a rare appearance on the track British Beat. The four tracks are taken from the forthcoming album, Britannia. The titles, along with the excellent sleeve, let us know the theme of the material. Songs steeped in British history, with sharp lyrics reflecting the multifaceted beast that is Great Britain. Let's start with British Beat, with guitars by Steve. We all know the boy can deliver, but every time I hear a new song I never fail to experience that thrill only Steve's guitar can produce. The track is a tribute to 60s British Beat: "All bleeding hearts and plastic flowers, mods and rockers and high-rise towers, when you hear those old 45s, you can see that distant look in Lennon`s eyes." Think summery sound, think Hollies, think Glam Rock, think punk rock, and top it with a lavishing of Jonesy. Add an infectious melody and memorable chorus, and a production reminiscent of Chinn & Chapman at their peak. It's that good. You think this sounds over the top? I've only just started; this is the best song of the summer. It doesn't end there. All four tracks took me totally by surprise. If it wasn't for Steve's involvement I wouldn't have given any of this a listen, but I'm so glad I have. It's not heads down and let's rock on show here, but a mix of different genres woven together with some style. Take the barber shop harmonies on Rule Britannia, almost hymn like, which dominate the opening couple of minutes of the song before the meaty guitar comes in dragging the song from the Cathedral onto the streets. And it's no piss take, it's a class and rousing piece of music that you can't get out of your head. England Expects delivers a history lesson from a 21st Century perspective, "From Africa to India to Singapore and back." It's smart, and soaked in an energetic melody which is clearly a hallmark of The Automatics and songwriter Dave Philp. By contrast, title track Britannia features the Haslingden and Helmshore Brass Band, and has a Chumbawamba folk vibe. Another mighty anthem (there's 4 anthems on here, yes 4). I cannot recommend this highly enough. The album is due next week. 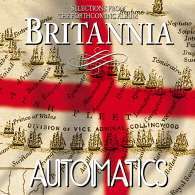 Be one of the first, get Britannia blasting out this summer and keep those England flags flying to the sound of The Automatics. This is the best set of songs I've heard this year.